This is the boot the whole touring world has been waiting for. 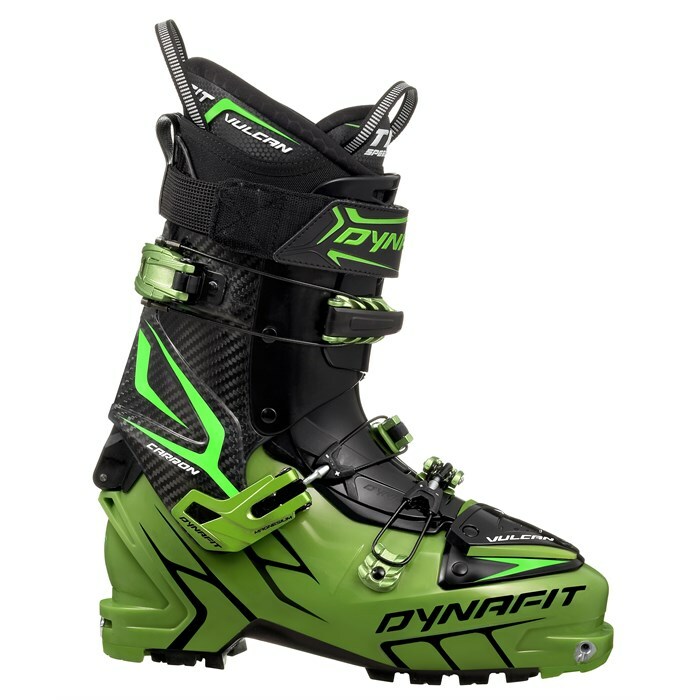 The Dynafit Vulcan TF Alpine Touring Ski Boots (otherwise known as the "Hoji" boots after pro skier and co-developer Eric Hjorliefson) evolved over the course of last season with Eric using his stash of miscellaneous boot parts to build up the ideal freetouring "Frankenboot." Crazy stiff when buckled due to the carbon fiber cuff, insane range of motion when skinning due to the Ultra-Lock Buckle System and it's 60˚ cuff rotation, and with fantastic heel hold-down from a middle buckle that lines up perfectly with your calcaneous, this boot is set to take over the backcountry freeride scene like wildfire. Why fight it? Pour some gas on the flames and light it up with the Dynafit Vulcan TF "Hoji" boot. Dynafit TF Liner  Thermoformable TF liner is heat moldable, warm and comfy. This liner features unique flex zones and optional lacing. Shell  Grilamid® construction for stiffness without the weight. Insulation  A special expanded polyurethane layer is glued inside the shell for warmth. Adjustable Forward Lean  15˚- 18˚ and release mode for walking/skinning. Ski/walk mode with 60˚ cuff rotation is activated by top Ultra-Lock buckle. Driving Spoiler  The rear spoiler slides inside the cuff for the widest possible range of movement while skinning. Removable Downhill Booster Tongue  This stiff tongue allows you to drive even the biggest of skis but can be removed for skinning. Buckle Cable Retention System  Central and cuff buckles are equipped with a special retention system that prevents them from opening regardless of tension. Ultra-Lock Upper Buckle  The Ultra-Lock system doubles as a closure mechanism and lean lock, doing away with the weight and bulk of traditional lean/lock systems. The double-hinging buckle lies flatter to avoid catching on rocks and bushes while climbing. Switch Power Strap  VELCRO® Brand Fastener power strap can be fixed to the tongue for easier tongue removal and to prevent flapping while skinning. Quick Step-In Inserts  Dynafits patented Quick Step-In Inserts make stepping into Dynafit bindings a breeze.